Gardeners it is time to get the kids in the garden and teach them where "real" food comes from. The expectations children have come up with for their food these days is insane! I consider myself a pretty healthy eater, even though I like my sweets, but I witness way too much processed junk going into our little ones faces! Kids thrive outdoors digging in the dirt and learning new things about nature, so encourage it and pass it on to the next generation! What are some easy to grow veggies? These are super simple to start and keep growing until harvest no matter what your skill level and can be planted in large or small gardens! Depending on where you live you can always attempt to grow much more, find out what grows best in your area with this Planting Zone Map. What kids learn from gardening? 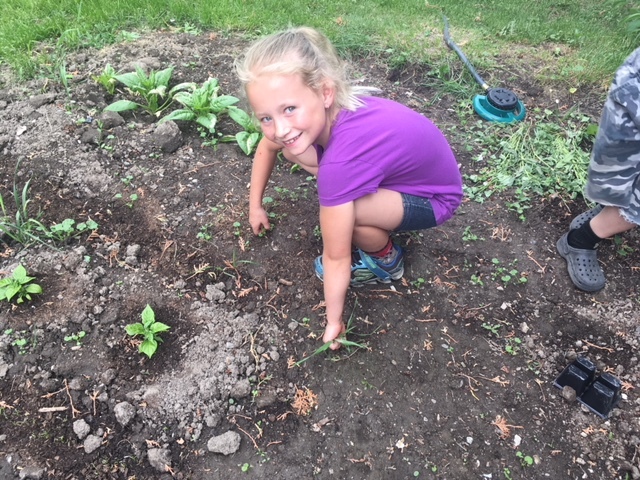 Not only are your kids gaining all these benefits but they are also outdoors having fun the way kids should be, and depending on age this can be a daily chore list item of weeding and watering the garden creating responsibility that kids need! If you have ample space you can take it a step further and plant a ton of different flowers and then have the kids setup a flower stand when they all bloom to sell bouquets creating a business opportunity. If your flowers don't sell out completely you can take the leftovers and get them to give bouquets as gifts to friends and family as well as local nursing homes teaching another valuable lesson about sharing and community! Everyday is a new opportunity to teach, learn and grow!